Background and aim There is a widely held and influential view that physical activity begins to decline at adolescence. This study aimed to identify the timing of changes in physical activity during childhood and adolescence. Methods Longitudinal cohort study (Gateshead Millennium Study) with 8 years of follow-up, from North-East England. Cohort members comprise a socioeconomically representative sample studied at ages 7, 9, 12 and 15 years; 545 individuals provided physical activity data at two or more time points. Habitual total volume of physical activity and moderate-to-vigorous intensity physical activity (MVPA) were quantified objectively using the Actigraph accelerometer over 5–7 days at the four time points. Linear mixed models identified the timing of changes in physical activity across the 8-year period, and trajectory analysis was used to identify subgroups with distinct patterns of age-related changes. Results Four trajectories of change in total volume of physical activity were identified representing 100% of all participants: all trajectories declined from age 7 years. There was no evidence that physical activity decline began at adolescence, or that adolescent declines in physical activity were substantially greater than the declines during childhood, or greater in girls than boys. One group (19% of boys) had relatively high MVPA which remained stable between ages 7 and15 years. Conclusions Future policy and research efforts to promote physical activity should begin well before adolescence, and should include both boys and girls. Systematic reviews have established that daily physical activity, particularly moderate-to-vigorous intensity physical activity (MVPA), is important for both the current and future health of children and adolescents.1 2 For many years the prevailing view among researchers, policy makers, and health and education practitioners, based largely on subjective measurement of physical activity, has been that levels of physical activity are adequate during childhood, but decline dramatically during adolescence, with the adolescent decline being much more marked in girls than boys.3–6 A more marked decline in girls may be related to their advanced pubertal maturation compared with boys, though the relative importance of biological and environmental influences on child and adolescent physical activity remains unclear.7 Much research and policy effort has been directed at adolescent girls, considered to be the ‘high risk group’ for low physical activity,3–6 with the implicit or explicit assumption that children and boys are at low risk. Many national and international physical activity surveillance programmes focus on adolescents,8 also based on implicit or explicit assumptions that adolescence is the stage of the life course when physical activity declines dramatically. While levels of MVPA among adolescents are typically much lower than recommended8 there is actually very little evidence that MVPA declines with the onset of adolescence, or that adolescent declines in MVPA are more marked in girls than boys. Dumith et al 9 published the most recent systematic review of changes in physical activity during adolescence, with 26 eligible longitudinal studies. Of these eligible studies only 2/26 included objective measures of the intensity of physical activity (accelerometry), most (16/26) were from the USA, and the representativeness of the samples in the eligible studies was usually unclear.9 Moreover, since most studies completed data collection before 2000, they probably lack generalisability to contemporary populations given recent and dramatic societal changes: declines in active commuting,10 in the technology being used by children10 (eg, the ubiquitous nature of new screen-based media),11 and in overweight and obesity (which appear to reduce physical activity).12 The International Children’s Accelerometry Database, though cross-sectional, suggests that objectively measured physical activity may be in decline in both sexes from around the age of school entry.13 We are aware of only one single longitudinal study which measured physical activity across childhood and adolescence: in children born in Iowa in the early 1990s physical activity declined, in both sexes, from age 5 years in most study participants.14 In summary, despite the well-established and influential concept that declines in physical activity begin at adolescence, an emerging body of evidence suggests that declines may occur earlier, but there is currently very little high-quality longitudinal evidence on the timing of changes in physical activity across childhood and adolescence in contemporary cohorts. The primary aim of the present study was therefore to describe the timing of changes in physical activity across childhood and adolescence, to identify when changes take place. Participants were from the Gateshead Millennium Cohort Study (GMS). Details of this cohort study have been published previously,15 but, in brief, the sample was socioeconomically representative of the north-east of England.15 This was a longitudinal study and the intention was to repeat measures in as many of the original cohort members as possible at subsequent time points. Habitual physical activity measurements in the cohort began when participants were 7 years of age (October 2006 to December 2007), and were repeated at 9 years of age (October 2008 to September 2009), 12 years of age (October 2011 to December 2012) and 15 years of age (September 2014 to September 2015). The study was approved by the Gateshead and South Tyneside Local National Health Service Research Ethics Committee for data collection at age 7 years, and by the Newcastle University Faculty of Medical Sciences Ethics Committee for subsequent measures. Informed written consent was obtained from the parent/main guardian of each child, and children and adolescents assented to participation. The methodology for measurement of physical activity in the GMS cohort is described in detail elsewhere.17–21 In brief, participants were asked to wear the accelerometer during waking hours for 7 days, removing only for bed and water-based activities such as showering, bathing and swimming. Families were also given a log sheet to note when the monitor had been worn and removed each day. The accelerometers were set to record data in 15 s sampling intervals (epochs) throughout the period the accelerometer was worn. Data were reduced manually using accelerometry output and log sheets, as described previously,17–21 to delete periods of non-wear time (corresponding to times noted by the parent, child or adolescent, as unworn). Total volume of physical activity was measured using the accelerometer output or counts per minute (cpm). Measuring the intensity of physical activity, specifically MVPA, requires that an accelerometer output threshold—‘cut-off point’—is applied. Two evidence-based but distinct ‘cut-off points’ have been used widely in the literature, but in the present study the cut-point of 574 counts per 15 s was used22 and it has acceptable classification accuracy.23 Since the Actigraph cut-off points used in this study were derived from studies using Actigraph model 7164 and the more recent Actigraph GT1M model has a consistent bias of 9% relative to model 7164,24 a +9% correction was applied to the raw accelerometry data before applying cut-off points. In UK children there are small seasonal variations in objectively measured habitual physical activity19 20 25 and so accelerometry measurements at ages 7, 9 and 12 years were made at the same time of the year as described previously17–21; at age 15 years close matching for season was not possible in all cases, hence accelerometry data were adjusted for season (summer or winter) during analysis. Height was measured to 0.1 cm with a Leicester portable height measure (Chasmors, London, UK) and weight measured to 0.1 kg in light indoor clothing and % body fat estimated with a Tanita TBF300MA (Chasmors, London UK).17–21 Body mass index (BMI, kg/m2) was calculated, and z-scores estimated to UK 1990 population reference data.26 Socioeconomic status was assessed using Townsend scores at birth,27 an area-based measure derived from the UK census. The sample size for the present study was fixed by the size of the recruited cohort at age 7 years, and the extent of sample attrition over the 8-year period. However, the sample size was similar to or larger than most previous studies with two measures of physical activity.9 14 Further, the accuracy of both the reported levels of physical activity and sedentary behaviour and the changes in levels over the 2-year period is increased by the use of accelerometry and the longitudinal design and analyses used by the study. Linear mixed models were used with SPSS V.21.0 statistical software to describe age-related changes in physical activity. Gender, age groups and their interaction were fixed factors and participant ID was the clustering random variable using unstructured covariance structure for age group as repeated measurement. For the MVPA data at age 15 years, season (winter or summer) was added as a factor to adjust for seasonal variation in physical activity. Post hoc pairwise differences were reported as absolute change with 95% CIs after Bonferroni adjustment. Group-based modelling of longitudinal data to identify distinct trajectories of age-related changes in physical activity was performed using the Traj module plug-in in STATA V.11.0. This method, initially developed by Nagin et al,28 has recently been applied to longitudinal physical activity data.14 Group-based modelling to identify trajectories can identify patterns of change, incorporating multiple different time trends and multiple different levels at baseline.28 Given potential differences in trajectories of physical activity change between the sexes, they were modelled separately for boys and girls. The trajectories were modelled using either quadratic or linear trends. In a step-by-step manner, we increased the number of distinct trajectories that can be extracted from the data, first by evaluating the posterior probabilities for each model for tenability and by comparing fit statistics as defined by the Bayesian Information Criterion (BIC) to be lowest. The process of specifying the number of distinct trajectories and selection of linear versus quadratic trend for each trajectory continued until there was no substantial improvement in model fit. Non-significant quadratic terms were replaced with linear terms irrespective of significance to ensure parsimony of the model.29 Using a maximum probability assignment rule, each participant was classified under a trajectory for which posterior membership probability was the highest. Trajectories and the 95% CIs surrounding each trajectory were plotted. A total of 545 individuals provided accelerometry data twice, and 217 at all four time points, with the sample size at each time point as follows: 431 (7 years), 428 (9 years), 385 (12 years) and 278 (15 years). The study flow diagram is provided in online supplementary figure 1. Participants who provided data at least twice had similar physical activity and similar BMI-z scores at baseline compared with those who had missing or invalid accelerometer data. Girls with more than two missing/invalid data points had slightly higher BMI z-scores at baseline than those with complete data, but similar physical activity. Summary data on total volume of physical activity (accelerometer cpm, a measure of light intensity physical activity and MVPA combined) and MVPA, at each time point between ages 7 and 15 years, are shown in table 1. Mean accelerometry monitoring period ranged from 5.3 to 6.4 days and 667 to 725 min per day across the four time points. The longitudinal trajectory analyses for changes in total volume of physical activity are shown in figure 1 for boys and girls: in the boys three distinct trajectories were identified, but in all three subgroups, representing 100% of the sample, the total volume of physical activity declined across the 8-year period from age 7 years; in the girls a single trajectory of declining total physical activity across the 8-year period from age 7 years characterised all study participants. None of the trajectories of total volume of physical activity showed initial high levels followed by sharp adolescent declines. 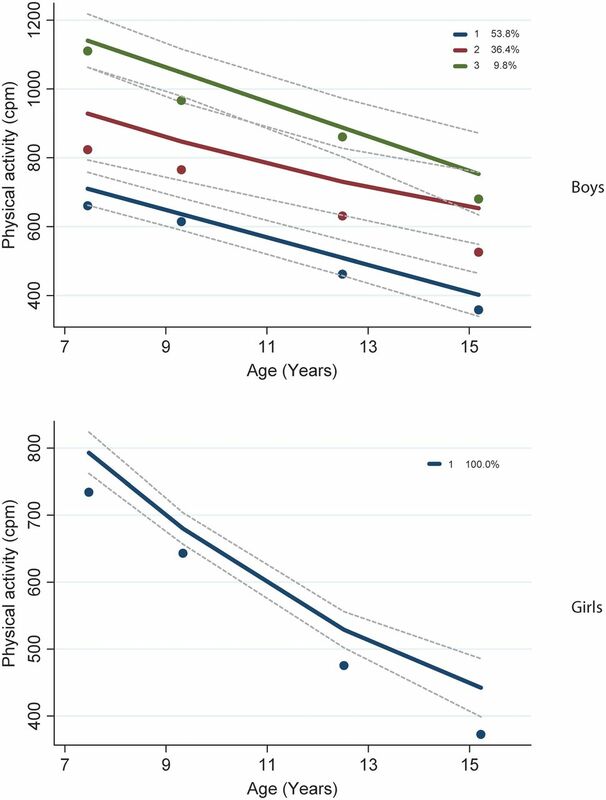 Change in total physical activity in boys (1A) and girls (1B) based on trajectory analysis. 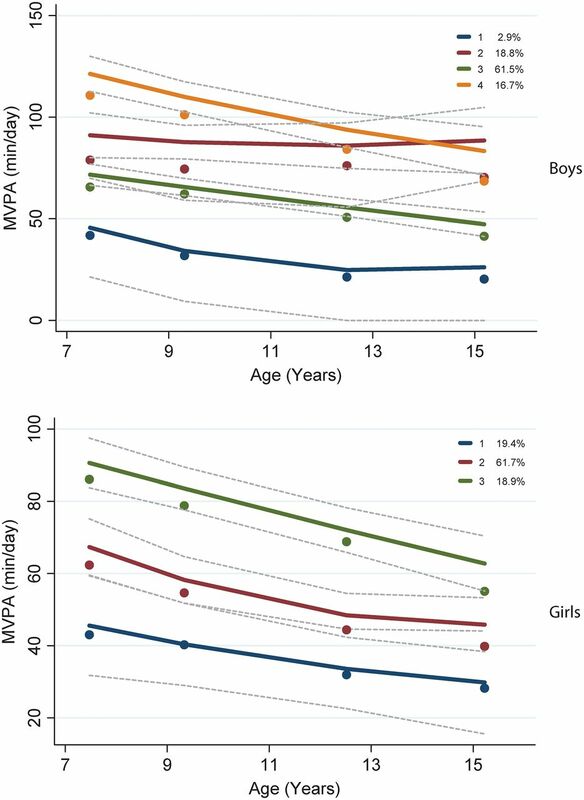 The longitudinal trajectories of change in MVPA for boys and girls are shown in figure 2. In boys, four distinct subgroups were identified: low and relatively stable/slowly declining MVPA from age 7 years across the 8 years (3% of the sample); initially high at age 7 years, but rapidly declining from age 7 years (17% of the sample); gradually declining from age 7 years (61% of the sample); relatively high and stable or increasing from age 7 years (19% of the sample). Change in moderate-to-vigorous intensity physical activity in boys (2A) and girls (2B) based on trajectory analysis. The longitudinal trajectories of change in MVPA of girls are also shown in figure 2. Three distinct trajectories were identified: low and relatively stable/ with modest declines (19%); gradually declining from age 7 years (62%); high initial MVPA with steeper declines from age 7 years (19%). None of the trajectories of MVPA in either boys or girls were characterised by high and stable childhood values followed by sharp adolescent declines. The present study suggests that total volume of physical activity is already declining by age 7 years in the UK. The present study found that 100% of boys and girls fitted into longitudinal trajectories which were inconsistent with the orthodox view that physical activity begins to decline at adolescence, declines much more rapidly at adolescence and/or declines much more rapidly in adolescent girls than boys. The present study therefore suggests that much of the current UK and international policy and practice in this area, based on the orthodox view, is not evidence-based. The main implication of our findings for future research and public health policy in physical activity and health is the need for a much greater emphasis on childhood rather than adolescence, and on both boys and girls. Trajectories of change in MVPA were more complex than trajectories of change in total volume of physical activity, but it is of note that in around 19% of boys MVPA was relatively high and fairly stable across the 8-year period. These distinct trajectories of physical activity are new, and their determinants are unclear, but understanding why a minority of participants maintained a relatively high and stable level of MVPA across childhood and adolescence would help inform future policy and clinical practice. Since the recent systematic review on changes in physical activity during adolescence by Dumith et al,9 four English cohort studies have reported on objectively measured longitudinal changes in MVPA during adolescence, though these studies do not span both childhood and adolescence. Harding et al 31 (n 363; age 12–15 years) and Mitchell et al 32 (n 5436; 12–16 years) found negligible declines in objectively measured MVPA during adolescence. Corder et al 6 (n 480; 10–14 years) and Collings et al 33 (n 144; 15–17 years) found small declines in MVPA which were slightly greater in boys than girls. In summary, recent English longitudinal studies which used objective measures of physical activity are consistent with the present study in suggesting that physical activity does not decline especially markedly at adolescence, and does not decline more markedly in girls than boys during adolescence. The main strengths of the present study were the longitudinal design, the high quality objective measures of physical activity, the socioeconomically representative sample and the contemporary nature of the cohort. One weakness may be generalisability to populations with substantially different physical, social and/or policy environments. Further research will therefore be necessary to determine whether or not the findings of the present study are generalisable to other populations. The present study aimed to describe when changes in physical activity occurred. The issue of why any changes take place (eg, the relative importance of biological versus environmental factors)7 is important, but is a distinct question which was beyond the scope of the present study. Changes in physical activity arise as a result of a complex and currently poorly understood7 combination of biological and environmental influences. An improved understanding of why changes in physical activity take place and why individuals follow one trajectory rather than another, would also be important to future public health applications, but would require measures which were not available in the present study (eg, ideally direct measures of biological variables such as pubertal maturation).7 Trajectory analysis can also act as a tool to predict future MVPA based on current MVPA status, and future research could also identify how accurate such predictions might be. The trajectory analyses identified relatively large subgroups, with one exception: the 3% of boys with low and relatively stable/slowly declining MVPA over the 8 years. Exclusion of this subgroup would have reduced model fit as judged by the BIC and CIs around the groups, and so it was retained. Future studies would be useful to confirm whether or not this small group exists in other populations. Finally, the periods between the four measurement periods in the present study were chosen so as to be adequate to detect longitudinal changes in physical activity between measurements (ie, to permit real changes to be distinguishable from measurement imprecision). However, timing of measurements was determined largely by the availability of grant funding, and more frequent measurements might have provided more nuanced evidence on the timing of changes. The authors thank PCT, Gateshead Education Authority, local schools, the External Reference Group, the research team for support in conducting the study, and especially thank the families and children/adolescents for participating in the study. Physical Activity Review Group. Five year review of ’Let’s make Scotland more active: a strategy for physical activity': Update statement from the review group. Edinburgh: NHS Health Scotland, 2010. Sportscotland. Increasing demand for sport and physical activity for adolescent girls in Scotland: Exploring issues and suggesting solutions. Edinburgh: sportscotland, 2006.
. Physical activity and adolescent girls – Knowledge Exchange Network. 2009. http://www.paha.org.uk/Feature/physical-activity-and-adolescent-girls-knowledge-exchange-network (accessed Jul 2016).
. Beattie A. Health and Deprivation: Inequality in the North. London: Croom Helm, Limited, 1988.
. Group-Based Modeling of Development. Cambridge: Harvard University Press, 2005.
. National diet and nutrition survey rolling programme results from years 1-4 (combined) for Scotland (2008/09-2011/12). 2014. http://www.foodstandards.gov.scot/national-diet-and-nutrition-survey-rolling-programme-results-years-1-4-combined-scotland-200809 (accessed Jul 2016). Contributors Conception/design: KVP, AJA, MSP, JKR, ARH, XJ, LB, JJR; Data analysis/acquisition/interpretation: MAF, JKR, JJR, LB, XJ. Drafting/revising critically for important content: all authors. Final approval: all authors. Accountability for study and manuscript: all authors. Funding The sponsors (Universities of Strathclyde and Newcastle) are responsible for research governance, but have had no role in manuscript content, or in the decision to publish, or where to publish. This study was supported by grants from the National Prevention Research Initiative reference (grant G0501306), and the Scottish Government Chief Scientist Offıce (grants CZH/4/484 and CZH/4/979) and the University of Strathclyde. The cohort was established with funding from the Henry Smith Charity and Sport Aiding Medical Research in Kids (SPARKS) and followed up with grants from Gateshead NHS Trust R&D, Gateshead Council, Northern and Yorkshire NHS R&D, Northumberland, Tyne and Wear NHS Trust. During this study period AJA was partly funded as member of Fuse, the Centre for Translational Research in Public Health, a UK Clinical Research Collaboration (UKCRC) Public Health Research Centre of Excellence. Funding for Fuse from the British Heart Foundation, Cancer Research UK, Economic and Social Research Council, Medical Research Council, and the National Institute for Health Research, under the auspices of the UKCRC, is gratefully acknowledged. AJA is currently funded by the National Institute of Health Research. Opinions expressed are not necessarily those of the funders. Data sharing statement The data on which the manuscript is based are available from the University of Strathclyde PURE/KnowledgeBase.